A great Russian beef recipe! This is what I was told on Saturday after finding Olivier in the butcher shop. He had ventured in with our shopping list and ordered 350g of beef shoulder. The butcher put the meat on the chopping block and with his knife poised asked what we were cooking. “Beef Stroganoff” Olivier replied. The knife went down and a knowing look came over the butchers face. “My friend” he said, “this is not the meat for you. For beef stroganoff only beef fillet will do! You want the most tender meat, cut into ‘allumettes‘ (thin strips) and then quickly seared in the pan. It will melt in your mouth”. And it did. The price was definitely not that of beef shoulder, but worth every penny. Beef strogi as it’s known in our family comes with many variations on a theme. However I like a simple recipe, made with only beef, onions, paris mushroom and sour cream. A little salt & pepper, garnished with chopped parsley and you have a carnivores bit of heaven. The name is likely derived from Count Sergei Stroganoff (1794-1881), a Russian official and gourmet! I bet you he was all over the beef fillet. Baked Apples seemed to be an appropriate welcome back, New Years resolution, apple desert recipe. What better way to satisfy your sweet tooth while watching your waist line. Plus baked apples are a cinch to make… core, stuff, bake. That’s it. No fuss no muss. Olivier’s parents have an apple orchard in France and this year they were overwhelmed with the yield. There were enough apples for the Russian army I tell you. So each week we receive a top up, which means I continuously have a bag of these golden red globes in my fridge. I would be complaining except that they are absolutely delicious and make wonderful apple sauce, pies, cakes, muffins not to mention baked apples. It is officially the 1st day of SPRING! So why am I writing about a winter soup you may ask. Good question. The thing is – the calendar may say that Spring has arrived, but while it is sunny in Geneva it is still very chilly. I was nearly blown away this morning when crossing the bridge – literally! It is because of ‘la bise’ a Northerly wind that comes whistling through the city at a bone chilling rate. It is at these times you really need some stick to your ribs, heart warming food. Years ago lentil soup was the very last thing on my list of favourite foods. It was something to eat under duress. In fact I was such a terrible child, that once my aunt went to all the trouble of preparing a homemade lentil stew and I turned my nose up and said I couldn’t possibly. Naughty naughty naughty. I have since grown up & so have my taste buds. The first lentil soup recipeI tried will remain nameless, as the spices were all off and it made enough for the Russian army… needless to say, I was not impressed. I have since fiddled and tweaked my way to come up with this version, with a hint of chilly, the tang of lemon, soothed with spices & served with a generous dollop of saffron, garlic roux! This year we spent New Years Eve in a quaint Swiss chalet, nestled in the mountains of Eastern Switzerland. It was here that I had the good fortune of meeting Roswit & her daughter Lilly, in the kitchen…. We got to talking about cooking (funny that!) and it turns out that Roswit’s husband is Iranian and she’s learned to make several Persian dishes over the years. This explained why the chalet was filled with the delicious smells & fragrant spices during the holidays. To my delight we exchanged details and one week later I opened my emails to find her wonderful Fesenjan recipe. This is a traditional Persian dish of duck, in a walnuts & pomegranate sauce. Roswit’s version uses lamb meatballs in a thick walnut, tomato & pomegranate sauce. It is not just the delicious scent of this dish that will capture your heart, not to mention your appetite, but the sumptuous flavour combinations. The lamb with cinnamon, garlic & a hint of sweet/sour pomegranate, with the unctuous nutty sauce that almost tastes creamy without the use of actual cream. In the future I will try this recipe with chicken or duck and perhaps decorate the top with pomegranate seeds. I also recommend using fresh whole grain / whole wheat bread instead of white bread or bread crumbs as it keeps the meat very moist & juicy. I also used a slightly larger quantity of lamb (280 grams total), as I prefer this meat to onion ratio. This dish is excellent served on a bed of basmati onion rice (** see recipe at end of post). My brother is currently an MBA student in Rotterdam, which means a crazy busy work schedule, with little time to do anything else but eat, sleep & study. I cannot help much with the later two but when it comes to the kitchen he has come to the right place. When asked what the magic recipe was to turn 24 hours into 48… I must say I was at a bit of a loss. However what I did have was a few ideas up my sleeve for quick & easy recipes that he could use as time savers. Lentils with Smoked ham & red wine: A wonderful winter dish, where the smell of onions, spices, garlic & red wine, simmering over a hot stove, invoke thoughts of mountain chalets, crackling fires, crisp evenings and good company. 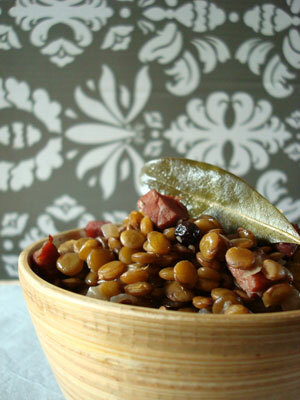 The smoky flavours of the ham go well with the warmth of the red wine and the slightly nutty flavour of the lentils. I find this dish quite filling so often eat it on its own, however it can be an excellent accompaniment to lamb, beef or a meaty fish (ie tuna).